STEAM Saturday is an exciting opportunity for our students in grades K to 8 to explore, discover, and learn outside the traditional classroom and be inspired to uncover their passion, gain motivation, and become lifelong learners. Across four Saturdays, students will engage in hands-on, interactive, and fun learning activities in a diverse selection of topics in Science, Technology, Engineering, Arts, and Math. The maximum number of students in a class is 12 students. Classes will be held at the High School, located at 54 Essex Street in Cambridge. Do you have a passion or a specific skill that you would like to share? Do you enjoy working with children and seeing their eyes light up as they discover something new? Then consider teaching a class in one of our upcoming STEAM Saturday Sessions. Each session is comprised of two (one-hour and fifteen minute long) classes across four Saturdays (dates listed above). STEAM Saturday course topics can range widely. Examples of past course topics include computer science and circuitry, environmental protection, geology, biology, DNA & cells, ornithology, keyboard fundamentals, dance, drumming, architectural model making, and coding, just to name a few. The only class requirements are that all courses must be hands-on, interactive, and fun as well as age-appropriate and fall within the areas of STEAM. Please fill out the STEAM Saturday Interest Form below﻿. 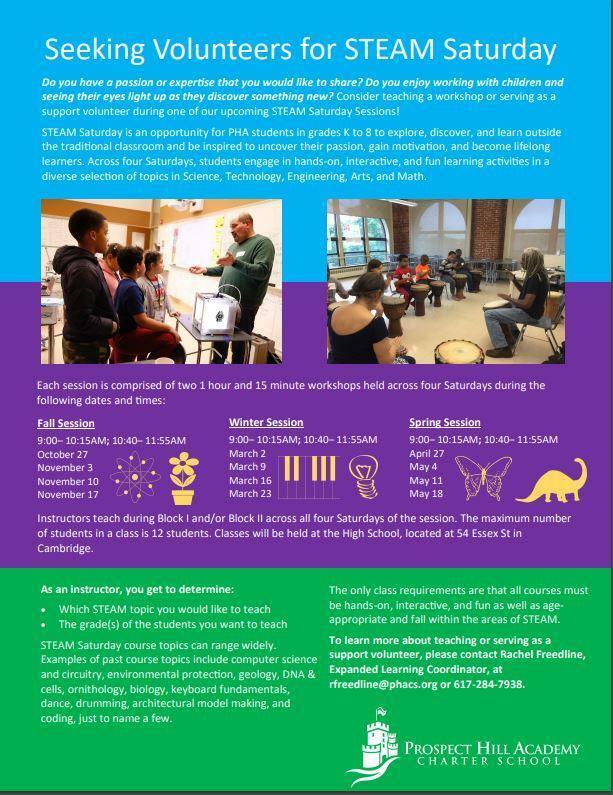 With questions and to learn more about teaching a STEAM Saturday course, contact Rachel Freedline, Expanded Learning Coordinator, at 617-284-7938 or rfreedline@phacs.org.